Come Sit with Me – Where Is My Teaspoon? Sunday Sunday Sunday. Always bitter-sweet. I’m on the couch now after a really nice day. Earlier in the week I got it in my head that we should definitely go on a picnic this weekend. 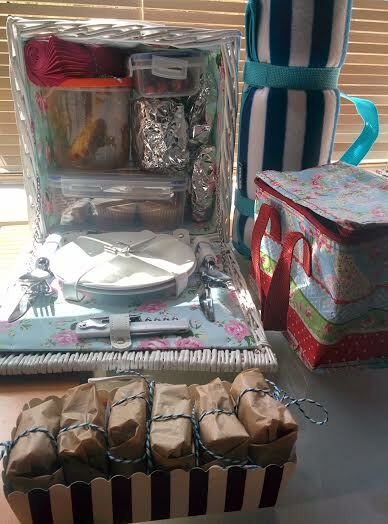 I had mentioned picnics on Where Is My Teaspoon earlier in the month and after reading more cookbook chapters on picnics I just couldn’t get the idea out of my mind so I went to TK Maxx the other day in search of a pretty basket and was determined to get out for one this weekend. To be honest I bought the cheapest picnic basket I could find in the shop because I wasn’t sure how much use it would actually get and didn’t want a massive one which would be a pain to store. I’m actually really happy with this find, at first I thought the white looked a bit off but it actually suits the striped blanket well and fit everything we needed. 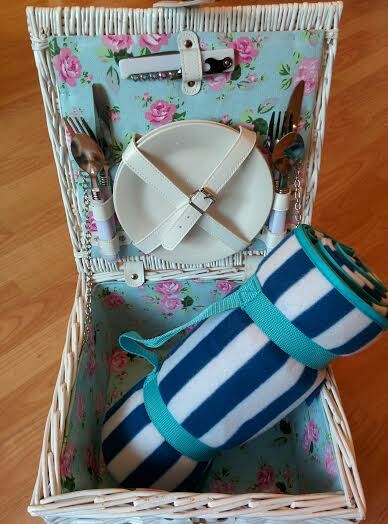 This basket was £19.99 and I think the blanket and the flask were a further £7 each. I have this rule about buying things – if it’s £19 then I have to use it 19 times so this will (hopefully) be the first of many different picnics this spring/summer. Filling the picnic basket did take some thoughts as I’m not one for just buying stuff to put in it – everything in this basket was homemade..which took hours so I don’t really blame you if you buy! I like to have a good mix of food to offer so had sandwiches, chicken drumsticks, savoury muffins, chocolate covered strawberries, pecan brownies and a big flask on hot tea. I’ll be sharing more on how I made these things later in the week so be sure to check back if you’re looking for ideas! We’re still in Cambridge at the minute so we took a spin over to Jesus Green and had our picnic there by the tennis courts. It’s actually a really nice spot for a lazy Sunday as the river Cam flows through so you could sit by the water too (if you aren’t scared of birds!). The thing about having a picnic in spring is that you need to remember it is spring and not summer. With this in mind I wrapped myself right up, even wore the hat I stole from my mum, as there’s nothing worse than being freezing sat on the damp ground. There was actually so many people sitting out, playing tennis and wandering around. When you’re sat at home you think there’s no one out just wandering but there is. 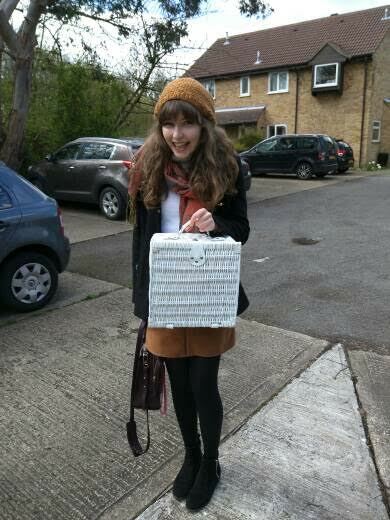 A picnic is definitely a good excuse to do some people watching. I’ll definitely share more about what went into our picnic basket during the week and my top tips for picnic prep too. I have one more assignment left to do for my Diploma so need to make a start on that over the next few days..thoughts of it! Until then, you’ll find me in my jammies and on the couch.